Just after 15:00 hours the doors opened and I investigated the place for the location of the stages and the merchandise stands. The main stage holds a capacity of about 1600, the small room 350 and the bat cave 150. The latter proved a bit small for some acts. The merchandise stands for the acts performing on the main stage were located very badly in the cellar next to the toilets. I had a bad feeling when 15 minutes before the start the venue was still rather empty. Fortunately in a few minutes it changed from rather empty to pleasantly filled. 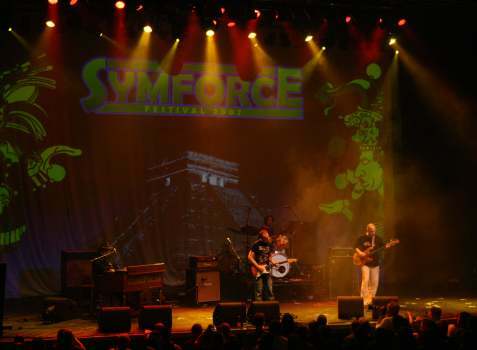 At 16:00 hours organizer John Bollenberg (DJ Bobo) welcomed all the people to Symforce. He wished everybody lots of fun at this musical picknick what is sure to become the European answer to Nearfest. First to go was legendary band Focus. In 2001 Thijs van Leer reformed Focus but without guitar hero Jan Akkerman. A few years later original drummer Piere van der Linden rejoined and guitar –talent Niels van der Steenhoven replaced guitar player Jan Dumée. Their latest album Focus 9 ~ A new skin is an album that holds the unique Focus style of the past, mostly instrumental songs with lot’s of organ and guitar melodies and use of whistling and nonsensical vocals. Most of the audience knew Focus from the 70’s era but were curious about what Focus would sound like 3 decades later. Apart from House of the king the set was nicely split in two, first part mainly new songs and the second part featured old songs. Because the new material also has that distinctive Focus sound people not familiar with their latest releases could easily appeal to the new songs. Niels van der Steenhoven, who turned 28 that day, was the revelation of the show and maybe of the whole day. Playing up-front center stage he played flawless with an ease seldom shown. The chemistry between him and Thijs van Leer, who is more than twice his age, was noticeable. During Eruption it was clear that the whole band played very tight, difficult time changes were easily overcome like a well-oiled machine. Bass-player Bobby Jacobs was given a solo spot to show his high skill of playing. For some reason drummer Pierre van der Linden was given two, though during the drum-solos he never reached the level of playing as he did during the songs.